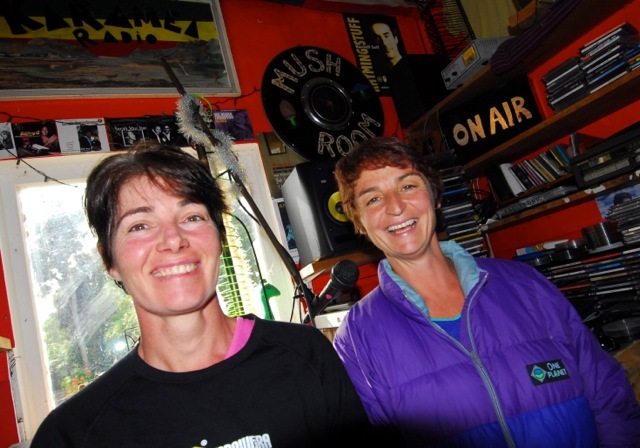 Trail Runners Vicki Woolley & Vicki Quinn arrived in Karamea after running the Heaphy Track in two days. They stayed at Rongo Backpackers & Gallery in Karamea and enjoyed a Heaphy Conqueror’s Feast, visited the Oparara Basin arches and caves the following day and ran back to Karamea along the Oparara Valley Track…tomorrow, they’re off to Vicki Woolley’s old hometown of Seddonville to take on the newest MTB track in New Zealand…The Old Ghost Road…Happy Trails for 2014 and beyond Super Vickis! Vicki Woolley is the N.Z. Editor for TrailRun Magazine: www.TrailRun.com She is a single mum on her annual one week holiday….Vicki Quinn is her friend and fellow trail runner. Paul Murray is the founder of the LivingInPeace Project. This entry was posted in Business, Department of Conservation, DOC, Education, Environment, Heaphy Track, Kahurangi National Park, Karamea, Karamea Radio, LivinginPeace Project, Media, Mountain Biking, MTB, New Zealand, Oparara, Permaculture, Photography, Product review, Radio, Social Commentary, Sport, Sustainablity, Tramping, Travel, West Coast and tagged Fitness, Heaphy Track, Interview, Kahurangi National Park, karamea, Karamea Radio 107.5 FM, LivinginPeace Project, Oparara, Outdoors, Paul Murray, Radio Karamea, Rongo, Rongo Backpackers & Gallery, Sport, Trail Running, Vicki Quinn, Vicki Woolley. Bookmark the permalink.